In anticipation of his upcoming conference presentation, Predicting Online Marketing Success: Five Lessons Learned at Predictive Analytics World San Francisco, April 3-7, 2016, we asked Matt Bentley, Founder of CanIRank.com, a few questions about his work in predictive analytics. classifying web pages as blogs, stores, social media, directories, etc. predicting whether or not a customer might be able to earn a link from a given web page. A: Online marketing has experienced an explosion in the availability of data within a relatively short period of time — social, behavioral, mobile, etc. In the blink of an eye we went from basically groping in the dark to having more data than it’s feasible for humans to process. By leveraging predictive analytics, our software can cull the important, high level actionable opportunities from all of the noise, so marketers can focus on actually getting things done, rather than spending all their time analyzing. SEO is a competitive field, so gaining 5 or 10% productivity over your competitors can make the difference between getting all the clicks and languishing in obscurity on page 2. Prior to CanIRank’s predictions, SEOs would often choose to go after keywords that were simply too competitive for their website, wasting months of effort or worse, desperation leading them into “aggressive” black hat SEO strategies that could cause their site to get penalized. With CanIRank, SEOs can focus on targeting keywords where they have a high likelihood of ranking, hitting many more home runs in the same number of at-bats. Thanks to predictive analytics, the battle is won before it is even fought (to paraphrase Sun Tzu). A: Since our software is used by a variety of clients the ROI depends upon what their previous processes were, but I can say that we were able to nearly double the accuracy of the best legacy SEO tools. A: The web is a messy, chaotic place for a rational data scientist, and it seems that once your sample size becomes large enough, the probability of impossibility occurring approaches 1 :). Deriving insights from this kind of noisy, error-prone, and semi-structured (at best) data requires some interesting jungle-style data cleaning guided by a hefty dose of domain expertise. I’m not sure my professors would approve. How to deploy predictive analytics models in real time web app environments. 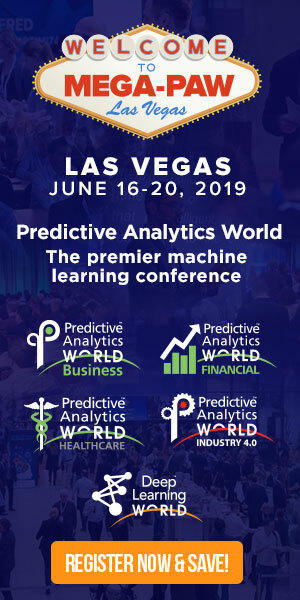 Don’t miss Matt’s conference presentation, Predicting Online Marketing Success: Five Lessons Learned on Monday, April 4, 2016 at 11:45 am to 12:05 pm at Predictive Analytics World San Francisco. Click here to register to attend. USE CODE PATIMES16 for 15% off current prices (excludes workshops).